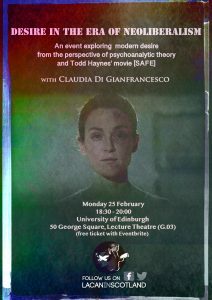 An event exploring modern desire from the perspective of psychoanalysis and Todd Haynes’ movie [SAFE]. There is little doubt that in modern society the desire of the subject is capitalised by neoliberal practices, which influences both the way in which desire manifests and the objects that it seeks. But how exactly is it exploited and manipulated by neoliberalism? In this talk Claudia Di Gianfrancesco will seek to address some of the current debates surrounding core aspects of neoliberal ideology by critically exploring the notion of desire. To this end, a quote by Margaret Thatcher will be analysed through Lacan’s University discourse, and consequently, neoliberal narratives surrounding accountability, ‘perfectibility’ and consumerism will be examined. Parallels between Todd Haynes’ movie [SAFE] and Lacan’s notions of the ‘divided subject’ and desire will be critically reviewed within the neoliberal-University frame, by screening clips from the movie. Lastly, Kristeva’s and Ettinger’s notions of abjection and matrix respectively will be discussed to forward both ways in which it is possible to resist the master signifier of neoliberalism; and to criticize Lacan’s conception of subjectivity. Claudia Di Gianfrancesco is a postgraduate student in Psychosocial Studies (MA) at Birkbeck, University of London. 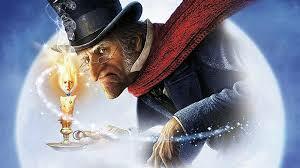 Next story Anticipation and Medicine – Is Screening Necessarily a Good Thing?